The Anglo-American aggressions and occupations in Afghanistan and Iraq, and the Israeli pogroms in Palestine are on the verge of extending into Africa -- Sudan. British and American politicians and media propagandists are presently galvanizing hostility to the "Arab" government of Sudan. We are examining why this is so. In context of their murderous history and current policies in the Middle Asia and North Africa, it is obviously not because they give a damn about the tragedy in Sudan but are opportunistically exploiting this tragedy. Rather, before a war is waged, the American people are brought on board by propaganda campaigns to demonize individuals in the government of the country in its sights as a tyrant, dictator, and extremist, a madman and a monster which has always been the role of the U.S. politicians and its media. 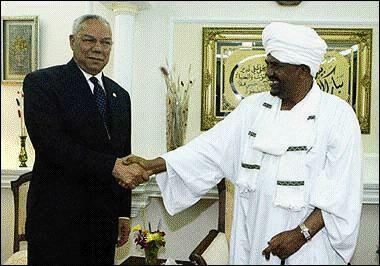 In an article posted simultaneously on Africa-Politics@yahoogroups.com and Laborpartypraxis@yahoogroups.com, Aduku Addea intimated the necessity for scientific economic and political analysis of the wars in Sudan. Aduku's article is presented in the body of this Essay, and his -- along with Connie White's, Roy Walker's and Gail Daggs' -- data and analysis are embedded throughout the Essay. The hypocritical sentimentalism of British, American, and Israeli politicians and so-called NGOs is dismissed. It is interesting that the ideologists and politicians that denounce impoverished Black governments in neocolonial Africa for demanding foreign aid, and African-Americans in America as dependent on 'big government', and in each case chide them to "do for self", are the very ones who are dismissing as inferior Sudan and the African Union's effort to solve the Sudan crisis. The Democratic Party's Congressional Black Caucus (CBC), together with a Christian Zionist outfit called "Christian Solidarity International" (CSI) have been in the News recently, protesting and calling for sanctions against the government of Sudan for defending itself against so-called Christian militias. These so-called "militias", armed, trained and funded by the United States and Israel have been at war with Sudan for the past five decades. Yet, the U.S., and Israeli political, intellectual and journalist circles are presenting the conflict in Sudan as a race and/or religious war. This is a false paradigm, the issues are not based in Sudan being a country in racial conflict and/or religious war, but is part and parcel of the geopolitical conflict, the U.S./Israeli objective to militarily dominate the entire region. Israel is the sole nuclear power in the region, has biological and chemical weapons besides, and with the support of the U.S., that arms and funds Israel, it has violated dozens of U.N. resolutions. The Congressional Black Caucus is a faction of the Democratic Party, several leading members of which have recently been in the news calling for sanctions by castigating the government of Sudan, as "Arabs" hell bent on a genocidal war on Sudan's Black African populations in the South. It has been asserted that the Northerners are Semitic Arabs, Muslims, and other Sudanese, while in the South are "Black Africans" -- Negroes, who are either Christians or heathen animists. Not only is this distinction categorically false, because all Sudanese are Black Africans, it is also condescending and insulting. Sudan cease its support to Palestinian resistance.